Enjoy your Sunday Easter holiday here at The Willow Creek Inn. 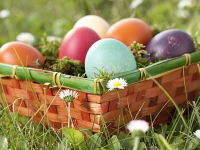 Treat your family to a beautiful spring spread, games and an Easter Egg Hunt for the children. Don't forget your Easter baskets!